Michelle Levy has been performing on and exploring the possibilities of bowed string instruments for over 20 years. She studied classical viola & Old Time fiddle/banjo at Brown University, then continued her musical studies in Medieval performance practice on vielle with Shira Kammen and with members of Sequentia at the Vancouver Medieval Programme. 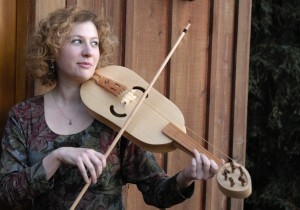 In addition to teaching violin/viola, choral music, and introducing students to Medieval instruments and music, she performs throughout the country with an eclectic variety of ensembles and vocalists, including the Boston Camerata, Celtic singer Abby Green, Maia Archote (Ozark-mountain singer/songwriter of the Year 2007), and Algerian Amazigh (Berber) songwriter Moh Alileche (IAP Best World Music: Africa 2005). She’s been a featured performer at the Connecticut Early Music Festival (2010) with Istanpitta Early Music Ensemble, and her new Contra-dance band, TriTonic, recently featured at the New England Folk Festival 2013 (NEFFA). Besides concerts, she enjoys playing fiddle for contra and English country dance camps in the woods as well as performing with Shira Kammen’s Class V Music, an ensemble dedicated to creating music on whitewater rafting trips. As a fiddle/violin teacher, Michelle is certified in the Orff Shulwerk approach to teaching music as well as the Mark O’Connor Method. She teaches all ages from 3 and up.